Short and sweet, Bass Bit #3 gives you a little excerpt of chapter 2, talking about the range of the bass (page 10) and what it means that we are a transposing instrument. Useful to know how the range of the bass fits into the sonic spectrum of the band. Let’s find middle C (AKA C4), sonically and on the score. The little 8 is sometimes used to point to the fact that the bass reads an octave higher than it sounds. 8vb (octava basso) means: transpose down an octave. This is also true if the 8 is missing. Chapter 2 gives a detailed account of not only the range of the bass, (four-string, five-string, six-string, take your pic), but also on how the bass is organized. It contains two tongue-in-cheek “Test Your Understanding” sections and a few great exercise for finding notes, which I am introducing in the next bits. If you’d like to study with me, click here. Bass Bit #3. Welcome! The bass – how is it built? What are the relationships of strings to each other? We are now in Chapter 2. 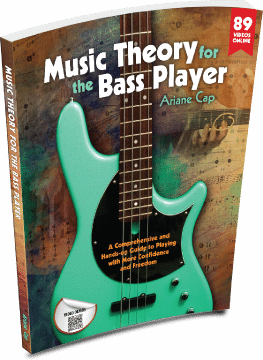 It is Chapter 2: How the Bass is Organized and there is quite an extensive explanation about the range of the bass. There is a “Test your Understanding” section. These are really fun, they’re brain twizzlers. So, if you think you have a handle on that and don’t need that chapter, then jump in right there. If some of those are confusing, then make sure you understand why they are, what they are. The answers to all questions are in the back of the book, in the appendix. I’m interested in the range of the bass. It is the lower end of the spectrum sonically, but the piano beats us by two notes. Even my five-string here with a low B-string is not the lowest string of all instruments or the lowest sound of all instruments. Now the piano is an instrument we play with a lot so we should know how we fit in to that sonic spectrum and the low A on the piano is in fact a whole step lower than my low B (I want to be the lowest! I just can’t get over that). So, that A is called A0. And the convention I’m using in the book is a commonly used one. So A0, so that makes my [playing: 1.50] B, B0. Middle C, maybe another note you are familiar with on the piano! My middle C is up here: [playing: 1.56]. Now, mind you, that makes that – that’s C4 or middle C, that is C4 [playing: 2.01], so that’s [playing: 2.03] C3, [playing 2.04] C2, and [playing: 2.06] C1 because it’s [playing: 2.08] B0 and then [playing: 2.10] C1. So the numbers switch on the note C every time. If you would be doubling something with a piano player and the composer would want you to be in the exact same octave, the piano score would look differently than your own score because the piano does not read transposed by an octave; they’re dealing with all these ledger lines or maybe with something called 8vb (“octava basso”), which is another shorthand for saying “take it down an octave”. Now on bass, we are always 8vb. And sometimes you see a bass clef on our score that has a little “8” on the bottom, that’s yet another way of saying: “go down an octave”. But, typically we know that; we don’t need the little 8 or 8vb to tell us. That was Bass Bit 3. Let me know how you’re getting on. I love hearing from you. Please send me a comment, send me questions. Thank you so much! Music Theory for the Bass Player, Chapter 2: How Notes Are Organized, A Little Excerpt.